HairColorCode.com is the number one resource for free hair color information from professionals and fans. Check out our hair color guides, ideas and advice. Choosing the right hair color which matches your skin tone can be tough. We offer the right advice & support in maximising how you feel and expressing your personality. As an alternative to harsh chemical hair dyes, using Kool-Aid (yes really!) to dye your hair is one of the simplest and most fun ways to change your look. If you’re not familiar with Kool-Aid, it’s a flavored powder that you mix with water to make a fruit drink. But what does this have to do with coloring hair I hear you ask? The individual sachets make it easy to try different colors on your hair and you can create multi colored highlights, panels or an all over color – let your imagination go wild! Using the Kool-Aid powders will create a semi-permanent color which will stay on your hair for around eight weeks. However the overall color result will vary depending on the color of your natural hair. Try to avoid light colors like watermelon, lemonade and strawberry lemonade as they are unlikely to show up, and use sugar free Kool-Aid where possible to stop the hair becoming sticky. Firstly decide on the color you want and then use a glass bowl to mix the Kool-Aid to get the desired end result (see the color combinations chart above). At this stage we are just mixing dry powder together to get an idea of the color. Once you’re happy with the color, add a little cold water to the powder to make a paste. The paste should be thick and creamy so add just a few drops at a time until you get the right consistency. If it is too thin then the color won’t take to the hair. Put a thin layer of petroleum jelly around your hairline and on your ears to stop the color from staining your skin and then make sure your clothes are protected. As with any hair color attempt, have towels on standby! Add a few drops of thick conditioner to the paste, then using the paintbrush or your fingers apply the paste to your hair and massage it in. Make sure it’s evenly distributed and that the color goes deep into the hair, which will create a level finish. Once applied, wrap your hair in cling wrap, or if you are creating colored sections or high-lights, wrap the hair in foil. This will help the color develop overnight. You can also wear a shower hat to sleep in to keep your foils in place. In the morning, rinse off the Kool-Aid and then shampoo and condition as normal. Your hair will be colored without any of the chemicals you find in regular hair dyes and you’ll have created your own individual look. Plus, your hair will smell fruity! Remember if you have long hair that you may need to use several packets, and that if you have dark hair the shades will not show up as vividly and may just give you a tint of color. Also if you have blonde hair, please bear in mind that blue and yellow make green! Gray Hair – A classic color back in style! This is crazy. I love it!!! Wow this is amazing my hair is really dark which color will look better. It can vary a lot, and one trip to the pool or waterpark can see it disappear. The best way I have found to get lasting results if you are dip dyeing with Kool Aid or food coloring is use hot vinegar rather than water. One to three months, but I guess it also depends on your hair color, how much Kool-Aid you use, and how long your hair is. Wrong, it lasts up to a year, so be careful. Mine lasted for about 7 months. I died mine with three packets of grape this way and it stayed fora single wash. Yep, just one. I’m younger, and I don’t have greasy hair, so that was three days for me. If you want it to stay longer, boil it. Hey I have light brown hair and I want to dye my hair with kool aid everyone says the blue turns into an ugly green but is it the same for the turquoise…. And does all the blues turn a ugly green color or just one specifically??? Use food coloring mixed with hot vinegar for deep blues, even on brown hair. You will get an ombre effect of turquoise to blue-black depending on how rich your mixture is. I use 10 drops to a cup and a half of near boiling vinegar for light to medium blond and dip in crystal light containers giving an ombre of 6 to 8 inches. TRUE LONGER U LEAVE IT ON LONGER IT SAYS..MY FIRST LEFT ON FOR I THINK MAX 10 MINUTES N STAYED ON FOR MONTH A. Hey I really want to kool aid my hair but I’m worried it would come out bad. I have curly light brown hair. I want to dye my side bangs. What shade of red or blue should i use? You really shouldn’t worry, the beauty of using kool aid for hair color is that it washes out so quickly, so even a disaster can be rectified in a couple of hours. In terms of color, if you are thinking of blue start by using Blue Raspberry as a base, and if you like how it turns out you can start mixing other flavors to get more experimental colors. I’ve read up in case of the same thing, if you don’t like it here are some ways to get it out. Vinegar is a good way to get it to take when dip dying too. It varies based on your hair shade and how much you use. Very light blonde hair can last up to a year, whereas dark blonde hair can last several months, and brown can last a few months or less. If you use less, it will make it less vibrant and therefore last less time. There are easy ways to get it out if you have to though. Would this work on dark colored hair? It’ll come out like highlights. it can really show up if u make it a darker color because i did mines red and it showed up perfectly. Sadly, the effects tend not to come out that strongly in dark hair. It depends how dark you are, but it’s definitely worth a try. The beauty is that the color will wash out really quickly, so you are free to experiment! I have always used the boiling water method. All you do is get about a cup of water and add the color of kool aid that you want. Then you should put the colored water in a saucepan. Let the water get pretty hot (almost boiling) and then pour it into a seperate cup. Dip the desired amount of hair into the hot kool aid water for awhile (around 5 minutes). After the time is up let your hair dry. This method last for a VERY long time and gives you a very bright color! If you want pink in a dip method go with pink lemonade or strawberry lemonade, but start with one pack. Alternately, for a more permanent and even brighter set use vinegar instead of water, think easter eggs. Personally I like substituting pink food coloring for Kool Aid since you are adding it drop by drop and that gives you a lot of control. If I have blonde hair and am doing hilights to only last a couple washes, do I need to leave the color in all night before I rinse it out? For dark hair to really take a vibrant color, you will need to bleach the highlighted areas first, and then apply a permanent hair color on top of the bleached areas. I love the affect your going for, and it will look really cool. It can be a tricky job, so if you don’t want to go to the salon make sure you get an experienced friend to help you. i have dark brown hair and i want to dye it red how much would i need to make it to were yu can tell its red but a dark red and wat last longer not useing boiling water or using boiling water ? so last summer i dyed the ends of my hair with bule and with in a few weeks it turned this ugly blue/green color… If i dye the ends with purple kool-aid will it turn a different color? Hey Samantha. I’ve been a victim of the blue to green nightmare in the past, but this wont really be an issue with kool-aid. By the time the a normal color starts to fade and morph into a less appealing shade, kool-aid will have washed out completely. It’s a really gentle color, so if any time it does start to bother you, you can power wash it straight out. Good luck! Hi Maria, it sounds like your hair is quite similar to mine. Good luck with the coloring, let me know how it goes. Thank you Susie! I applied the “Dark Blue” mixture to my hair, and it kind of came out green.. My natural hair is black, and I think I’m just going to stick to dying it with a blue shade. Your link was very helpful, by the way! You’re welcome Maria. Sorry to hear the kool-aid didn’t work out for you. Please let me know if you find a natural solution to lightening your hair enough for the blue to take, I’d be really interested. Thanks for all the great information, it’s been quite helpful! Now I have dirty blonde wavy hair, with an ombré effect of lighter (grown out bleached) hair. I want to dye a couple of of my waves pink, and add purple to tips with the color bugs I have been currently using to make mermaid effect. Since I’ve been testing the waters with wash out colors, I’m ready for the next step.. I was thinkig about using manic panic semi perm but I find the kool-aid method pretty cool for a natural 90’s kind of method. I don’t see pink in your charts above, would it be possible for me to achieve a pink color? I love the manic panic hair colors, definitely a good choice to be looking at. It’s tricky as none of the flavors we’ve looked at produce a naturally pink shade, the best way of getting this look is starting with one package of double double cherry, which will start at a pinkish color. You can add more mixture to go a bit brighter, but unfortunately it will eventually start to turn to red. Your hair sounds great, I’m absolutely loving the ombré look. One idea that might suit you better is trying chalk, which will help you get a more vibrant pink look. It’s really in trend at the moment, check out this awesome guide. Let me know what you go for, and how it turns out. So if I use cold water it will work to?? It will still work with cold water, but it seems that hot water will help the color last a bit longer. Hey Casey, if you leave it in a little longer it might help the color take better to darker hair, but saying that it isn’t going to make a huge difference so make sure you wash it out a couple of hours after you wake up. If it’s not as vibrant as you’d like, you could always try using more packets of kool-aid in the mix. Hey Pinkie Pie, first of all bravo on trying the blue raspberry and lime! Typically if you added more lime it would go from turquoise to a greener color, but the beauty of this product is if you don’t like the result it is easy to wash out. If you go for it, please let us know how it turns out! I dyed my hair with koolaid and it lasted a whole lot longer than 8 weeks!! I dyed it at the end of January…and it is still in my hair. Granted, the color has changed…it started out as this super pretty bright teal/blue, but after a few weeks, it faded to a deep green, and that green has stayed in my hair forever. I actually cut my hair and the green was still there, and there is just a little left from the hair I didn’t cut. I dip-dyed my hair with the koolaid and it turned out AWESOME looking, my hair is red so the bright blue tips looked so cool. I’m actually going to do it again, but I’m trying a purple so that it doesn’t turn nasty green! I don’t think purple would really fade into any other color..would it? Anyways…with adding the Triple Awesome Grape Koolaid to my reddish brown hair, will it stay purple or will it turn a different color when it’s mixed with my hair color? Normally I would just try it but since it lasts so dang long in my hair, I want to be sure it’s the right color. Thanks! Wow, I can’t believe it’s lasted so long for you. The most I’ve ever seen before was a week or so, and that was on super light hair. I absolutely love the sound of the blue tips, I might even try that one myself. Do you have any pics you could share? If so I’d love to put them on our Facebook page. Mixing the purple with your red/brown hair won’t cause any disasters (definitely no green will show up! lol) The only worry is that it might not show very strongly if you’re hair is particularly dark. Hi Lilbit. Depending on your natural shade you might be able to get a maroon color. Lime, blue raspberry and double cherry will give a deep purple, but hitting a perfect maroon shade will depend on your natural color. Yeah I really liked the way it looked, I just wish the blue had last longer because it only stayed for a few weeks before I was stuck with the deep green for the past few months. I have no clue why but my hair takes really well to anything I do to it. I have a picture of my hair right after I had dyed it with the blue tips that I could share, what is the link to the facebook page? I didn’t take any when it was green because I wasn’t very happy with the green against my red hair..haha 😛 Maybe it was the way I did it that caused it to stay so long because I did it differently than above. Anyways…the store was out of Koolaid brand in the grape flavor but I got a Great Value brand..will that work the same? Thanks! I have dark brown hair basically 1B how well will it show up? I really want to try this cause I have a hool-aid that will give me the color i want in a sam club sized container! I’d love to see you on there. Eek, not sure how the Great Value brand will work. They tend to be made up of the same formulas as the traditional brand so I imagine it will work the same, but wouldn’t want to say for certain. Let me know if it does, it will be a great tip to share with our followers. I Quenya, on a 1B tone a Kool-Aid color won’t show up particularly well, but it will give you a nice tint that will look great when the light hits it. It will be a much more subtle color, but color still look great. If your hair is really dark (level 1 or 2), it might struggle to take. There are no chemicals in the kool-aid so it simply stains the hair rather than strips it like a proper hair colorant. It really depends what kind of finish you want, if you are looking for ‘tint’ of color then you should be fine, however if you are looking for a vibrant dip-dyed look (like Jesse J here) then you will need something a little stronger. I just dyed my hair with the Great Value Grape kool-aid mix…it worked really amazingly well!! I was disappointed at first because the color when I first mixed it and poured it into the bowl looked really dark blue but on my hair, it turned out purple with a reddish tint! I did it differently than above though but it worked SO well. Gah I am so excited! It’s also kind of an ombre effect because I dipped it in a little more than i wanted but then I let the bottom part soak longer, so the bottom is dark purple and then it goes lighter into my natural hair color. Anyways, it works great with the Great Value kind! Hi Ally, really glad again that the Great Value kool aid mix has worked so well! Glad your excited and I hope this color lasts as long! I have a lighter shade of red hair and I was wanting a pale purple like a lila color. I was going to try to mix a blue and red to get the shade but I am worried it will not stick. I also am not sure if I should use the boiling water method or the conditioner method. So, lats night I did the cold water conditioner koolaid dye method with tropical punch. Im a afraid to take it out.. Because I don’t know what the color will be like. And I dont know what to do after I take the dye out. Do I wash it or do i condition it. Im so confused. And I have kinna Dirty blonde hair so what is the dye going to show up as? Also how long will it stay in??? Xoxo. The beautiful thing about using Kool-Aid to color your hair is that there is plenty of room to experiment with mixing colors, and if it goes wrong it usually fairly easy to wash out. To hit a lilac your right in mixing blue with a little red, just have fun with it until you hit the perfect color. The main difference between the two methods is how long the color stay in. We are hearing that using boiling water helps the color take for a couple of weeks, whereas using conditioner it can usually be washed out in a couple of days. Hi Hunter, sooner or later you’re going to have to have a sneaky peak, so just go for it! Give your hair a normal shampoo and condition to get rid of any residue, and you will be good to go. If you’ve used the conditioner method, it will usually last a few days. Have fun with it and done worry, it’s not a chemical product so even if you don’t nail the color the first time you will be able to try again without any damage. Hey I dyed all my hair with red koolaid. It worked really good but I’m getting worrie it won’t come out. I have brown hair. Every time I take a shower a little more comes out. My parents want it out now. I keep hearing people saying it doesn’t come out. How do I get it out? Please help! – The method you used to apply to your hair (did you use hot or cold water? how long did you leave it on? The longest I’ve heard of it being visible is a couple of months (mentioned in the comments above), however in my personal experience I’ve never seen it last more than a couple of weeks, and that was on platinum blonde hair. Keep washing your hair and use a good conditioner (not a color protecting one! lol) and it will be gone before you know it. I have naturally brown hair but after many years of dyeing Im at a honey blonde with highlights, Id like to achieve a dark purple like Katy Perry, since I have a light base can that be achieved? If so with what color kool aid combo? Going from honey blonde to a dark purple won’t be a problem, however I wouldn’t necessarily recommend going with Kool-Aid for that look. Kool-Aid tends to come out in lighter pastel shades, so the purple would quickly fade to a violet color. The colors really do only stay in for a matter of weeks, so if you are just looking for a very short re-style then it will work, but if you want something more serious then I would advice using a semi-permanent color at least. Let me know if what your plans are and I will hopefully be able to give you some more specific advice. Im planning to boil water and use Kool-Aid to dye my hair. The only thing is, my hair is black. Which color would you recommend I use to at least see a visible color other than black? With black hair you are unlikely to get any real show of color from using kool-aid, however you should still be able to get a cool ‘tint of’ color which will show under certain lights. Just picture it, you turn around and as the sun catches your hair your friends see some awesome and awesome streak of blue! In terms of color, blue or red are definitely the ones that will be the best match, and potentially most noticeable with black hair. Please let me know how you get on, and good luck!! Sounds very cool. If you want to go for a longer lasting color, I would definitely recommend using the hot water technique. We’ve been trying it recently here at HairColorCode HQ, and it really does last longer. In terms of color, I’ve found that the bright blue fades to a turquoise color as time goes on, so really you can have the best of both worlds! Hey Amya, if you use 3 or 4 packets, you should get a really nice purple hint to your hair. It wont be a bright purple though, to achieve that look you’d need to go lighter first. In regards to swimming, Kool-Aid is a really gentle dye as it doesn’t get deep into the hair particles. This makes it nice and easy to wash out, but at the same time it means it’s not strong enough to fully survive a trip to the pool. It won’t come out completely, but I wouldn’t be surprised if you saw a bit of purple water around you! Good luck, and let me know how you get on! does it hurt the pool, chemicals or the filter? Not that I know of, but if you stay in one place and leave a big floating ring of color around you, the lifeguards will give you that look of we’re going to blame you. My friend and i thought it would be a fun idea to dip dye our tips for the summer. I had some questions though, we’re both blonde, and I wanted to dye it red or pink. Do you know how long it will last? And, also, does it damage our hair in any way? Hey Cami, the dip dyed blonde look is huge right now, so you and your friend are going to look great this summer! If you use the cool water and conditioner method above it won’t last more than a few weeks (it can come out much quicker though depending on how often you wash it). If you use the hot water method mentioned in the comments, you might be able to get it to last all summer! my hair is strawberry blonde(natural) and I was wondering what colors would look best? how long does it last because my friend did it with out water only conditioner and it last for one year but she only did the ends. Me and my friend just dyed our hair with kool aid and we want to go swimming, how long should we wait to get it wet? Don’t worry, the mix doesn’t automatically go green. Blue and Yellow naturally make green if mixed 50/50. To get the electric blue, I would recommend a split of 80/20 with the majority of the mix being the Blue Rasberry. Hey, I have straight, dark brown hair but I would like to highlights some parts of my hair Turqouise from your chart above. How can I make it so the color is visible? To get a turquoise effect on dark brown hair you would need to lighten the desired areas first. If you applied kool-aid or any other temporary hair color to your dark hair, it would simply show as a ‘tint’ rather than the full color. If you’re confident at home hair color (or know someone who is) you can lighten the hair using a store kit, and then apply a temporary color once it’s settled. The day after you kool- aid your hair can you swim??? Although swimming won’t do any damage to the hair color, there may be some wash-out in the pool. Make sure you’ve given your hair a thorough wash and condition the morning after coloring, and this will keep any wash-out to a minimum. From my experience the colors kool-aid colors aren’t vibrant enough to get a true burgundy color, however if you mix red and purple, or red and blue, it may be possible to get a deeper purple (depending on your natural hair color). Kool-aid colors come out in pastel shades, so if you do want a darker or deeper color it might be better to consider a temporary hair colourant. The colors come out in quite a light pastel shade, so the lighters colors would only really come out if you used a lot of them AND you had really light hair. If you use kool-aid as a hair dye on darker hair, it tends to just show a tint of color when under the light. Which is still quite a cool effect! If you hair is dark unfortunately you won’t be able to achieve a true turquoise color without lightening your hair first. If you color it without lightening it you will see a tint of the shade in your hair in certain lights, but it wont effect the day to day color. Hi! I have blonde hair and I want to do blue bangs, would that come out ok with kool aid? Lillian, blue bangs on blonde hair would work nicely with kool-aid. I’d love to see a picture when you are done! are there any other kool aid mixes you could use that arent up on the chart that would make a pretty color? The only limits are your imagination, there are potentially hundreds of different shades you could come up with by mixing the packets in different quantities. I guess the only thing you will struggle to do is come up with darker colors, as the kool-aid colors seem to come out in quite a light pastel shade. I like your style, it sounds like it’s going to look great! It’s entirely possible to do three separate colors using the boiling water technique, although it will take some time and patience. Basically you’ll need to do one color at a time, and depending on how confident you are in your application skills, you might want to cover the strands you aren’t coloring with kitchen wrap so there is no overlap. I read your article, and i really enjoyed it! I’m thinking about dying the tips of my hair a cherry/dark cherry red color. My hair is naturally a brown/light brown color, and in the sun you can see a few highlights of blond, and red. all of my hair is natural! people say it looks a little bit like an auburn color. My hair is long, and really curly. I was hoping if i dye my hair, it would last about 3 to 4 weeks, and i want it to look vibrant, like really vibrant! lol. which method( cold water or hot water) would work better? Also what colors of koolaid should i use(should i mix any colors together)to get a cherry/dark cherry red color? How many packets of koolaid should i use? How long should i leave the dye in my hair? Also does it harm your hair in any way? After i dye my hair, how long should i wait until rinsing/washing my hair? Is there anything else i should know about dying my hair with koolaid a cherry/dark cherry red color. Any tips or info.? Thanks sooooo much! I really appreciate it! ^oops, i forgot to say, that i kind of want it to look like Ariana Grande’s hair color. thanks so much! I have auburn red hair, and last night I dyed it with grape koolaid and it turned black..so I wrapped it up in plastic wrap and went to bed and woke up this morning and washed my hair and the color is completely gone. it looks as if I never dyed it. I didn’t use your method though, I found a method on a website that said to add drops of boiling water to the koolaid powder and mix it up to a paste and apply it to the hair and wrap it in plastic.. either that method doesn’t work, I did it wrong, or it’s the color of my natural hair that’s the problem.. what do you think? It sounds like your hair is too dark to take to the Kool-Aid color. The colors come out in a really light pastel shade (like the photo in the article), so if you have a naturally auburn color it might be just too dark to show. Saying that, how many packets did you use? It might be worth trying a little more to see if you can get it to take. If that doesn’t work, I’m afraid you will have to consider a temporary hair dye to get the look you want. Sadly, you wont be able to achieve the kind of vibrancy needed for Ariana Grande’s look using kool-aid. These colors come out very light, the opposite of dynamic really. To get this kind of effect you would need to use a temporary color, or one of the awesome semi-permanent colors from the likes of Manic Panic or Fudge. Hello. I dyed the tips of my hair with the Tropical Punch packet [red] and used the boiling water method. It’s been about two weeks and the color has definitely faded but the tint of red it still visible. I really want to try out purple, but I’m not sure if the color I already have on my hair will affect the color I’ll get with the purple. Should I wait for the red to fade out completely or do you think it’ll be fine? i want to dye my hair dark red and i have almost black hair will it work out good? if you flat iron your hair after you dye it will the dye come off on the flat irons or at all? To go for a red using kool-aid just stick with the cherry flavor, but it wont come out as vibrant as you like. Have you seen the pillar box red from Fudge? That might be a better option for you (although more permanent that kool-aid. I’ve not tried using flat irons when I’ve used kool-aid, but I don’t think it would be an issue. Have any of you other guys any experience of flat irons on kool-aid colored hair? i have black hair and want to dye it red but i dont know if i should do the tint or regular red. which on should i pick? It’s unlikely you will get much of a show at all on black hair, so definately go for the full red and use a good three packets. You still might not see much color in the result though as the kool-aid shades tend to come out quite light. hi susie i just dyed my hair with the tropical punch kool-aid last night, and i was wondering if im going to splish splash tomorrow will it come out fade or just stay the same. is there any ways i can protect my hair, maybe not going under water and putting my hair up in a bun what should i do??? If you read through the comments you will see a few people have been in a similar situation. Kool-Aid isn’t a formulated hair colorant so sadly there isn’t any real protection against fade, and it will really be down to how much chemicals are used in the water park, and how well the dye has taken to your hair. But to give yourself the best chance, make sure you give your hair a thorough was the morning after you’ve colored it (ideally with a color protect shampoo), and if you can put your hair up to keep it out of the water you should be okay. I was just wondering how that Ally girl dyed her hair with koolaid. She kept saying she dyed it differently than the ways you directed above and hers lasted a long time. I have dark brown hair and I’m thinking about tip dying or maybe just putting highlights in my hair with red because I was going to do blue, but I don’t want to risk green. Aha. I was just wondering how that Ally girl dyed her hair with koolaid. She kept saying she dyed it differently than the ways you directed above and hers lasted a long time, like, months, and thats what I’m interested in. Aha. I have dark brown hair and I’m thinking about tip dying or maybe just putting highlights in my hair with red because I was going to do blue, but I don’t want to risk green. DX Ahaha. Haha, great minds think alike! Yep, we have tried and tested Ally’s method of using boiling water, and it does work well and give a longer lasting color. For us it was a matter of weeks though and not months, but if you read through the comments you will see people who have managed to get some longevity out of the color. Aha okay thanks! The way I’ve always done it for my tips were just to take the powder, add like, not even a teaspoon of water, and TONS of white conditioner till its the consistency of hair dye. Then I just rub it in and let it sit. If you’re blonde and you use red, just two hours works, and for blue, you need four to six. If you’re s brunette, then I’m putting the Ted in for at least four to six hours. I haven’t tried the blue yet(: hopes this help for brunettes! Hello. I’ve been wanting to dye the ends of my dark brown hair with kool aid for a long time. Since I have darker hair, do you suggest that I bleach my ends before using the Kool Aid? I want a bright color & seeing the comments above it looks like I won’t get my desired bright color unless I bleach my ends. I am sure your advice will be a great help Arts! If you do try the blue you will have to let us know how it goes! If it’s a bright color you want to achieve then bleach is required. Do you have a color in mind? Hi, I used the hot Kool-Aid method on a tiny section on the back of my head, as a test trial. I have medium brown hair, but the Kool-Aid completely dyed my hair bright red! I’m happy with the results, although I was wondering how long thr results will last. Also, how do I get the color out, and if this is possible, will my hair return to the original color? There seem to be mixed results using the hot water method. When I tried it it stayed around 2-3 weeks (and the usual method only lasts a week or so). However, if you read the comments above there are examples of people who have managed to maintain the color for several months. The important thing to remember is that kool-aid is not designed to be used as a cosmetic product, so there are no hard and fast rules as to how it works, so should be used with caution. I have dark brown hair and I wanted to dip dye my hair blue….would that work or would red be better? And I know it’s better to bleach it but I don’t think my mom would allow that. And school starts in six weeks so would it come out by then because I was going to use the boiling method. Thanks. Blue or red dip dye looks fab with dark brown hair so whatever you are feeling the most, go for it! To ensure you achieve a bright shade you would need to use bleach, so if you think your mom would shout make sure you speak to her first. We can never guarantee that the color will fade but the more you wash your hair the more the color will fade so bare that in mind. – Yep, with blonde hair you will get the turquoise or red tint you see in the picture at the top. How strong it comes out depends on your natural hair color and the amount of product you use, but if you’re a blonde the colors will be quite close to the picture. – If you are going for a did-dye effect, it might be better to site with your head down so gravity reveals the true ends of your hair, then apply the paste to the tips. – 3-5 hours might not be long enough, realistically I’d suggest 8-10 hours to get the full effect. Sooo like lean back on a chair and m somewhere! y hair hang down with a towel on the chair?! I dont want to sleep with it in BC im taking my permit test this week as well and friday im flying somewhere….. 2 more questions. Can I just hold it with wrap and a hair band ?? Also I change mypart often and its far over and there’s a puff like a wave haha so what should I do with that hair ?? Thanks. I was thinking a “bright” light blue color. And I have decided I am going to bleach a strand before dying with the Kool Aid so I can get more of the color I want. Also, I was wondering what method you think works best or lasts longer, the conditioner method or boiling it on a stove. Thanks for your help. Thanks for your other questions Melanie. You can use a hair band to hold the wrap in your hair if it makes it easier for you. In regards to your parting, I would style your hair with the parting you use the most and then apply the dye. I hope this helps and good luck with your test! I hope you get the bright light blue color you are trying for! Hi i just found your page after searching online for different colored hairstyles & etc…first of all thank you for sharing this i never knew you can use kool aid to dye your hair, its something i really want to try out now(:…. im thinking i might dye the tips of my hair, the color im not so sure yet but i was wondering since my hair is dark brown will most of the colors like maybe purple or a lighter blue show up as well?????? Blue does show up well on brown hair and red tips seem to be a favorite too. The beauty of Kool Aid is that you can be as creative as you like. Pink on your brown hair sounds fab! You can buy pink Kool Aid (there are more colors than the ones shown on this page). Generally, the more packets you use the stronger the pink will be so as your hair is thick, I would suggest to use a couple of packets at first and see how the color turns out. A good thing about Kool Aid is that it doesn’t last as long as using hair dye. I wouldn’t think that sweat would be an issue, however you could tie it back to be on the safe side. Both methods for Kool Aid work well so it really is what feel most comfortable with. Pink or blue looks really great with blonde hair, would be nice to see how it turns out for you! You can leave the Kool Aid in all day, however the longer you leave it the stronger the color will be so bear that in mind. Hope it works well for you! hey i have dirty blonde hair. what color would look the best and stay in the longest? and would dying the tips or just a streak look better? I have dark brown hair, and i want blue, bright red and light green highlights would the kool-aid method work? how long do i have to keep it in for? 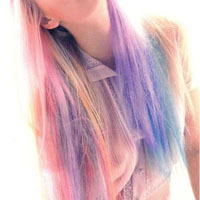 Blue and pink are favourites on blonde hair and they look great with just the tips dyed. A bold color like purple might look good as a stripe. It also depends on the length of your hair.. dip dye generally looks better on longer hair than short. Hope this helps and feel free to let us know what you decided on. If you go for the dip dye effect, try leaning forward and dipping your hair into the mix and it should only dye the ends of your hair without bleeding on the rest. A great thing about Kool-Aid is that it washes out very easily. I hope this answered your question. You can definitely give this a go! I would recommend creating each color mix in separate bowls, then using the highlight method of adding color to sections of hair and wrapping them in foil. It sounds good and we are all interested in seeing the result! A lot of people dye their hair overnight and wash off in the morning which could be anything from 6-8 hours. There is no exact length of time but the longer you leave the mix on the stronger the color would be. You can use any of the Kool-Aid Colors. The things that will affect the result are your own hair color, hair type and how long you leave the dye on for. What color is your hair? I’ve been looking for blue raspberry and lemon lime but cannot find it in grocery strores near me. Where can we get these color/flavors?? Sorry to hear you can’t find the colors you want in your local stores. You can buy from http://www.koolaidworld.com so if you can wait for delivery try that! With Kool Aid there are no absolute guarantees and it does show up better on lighter hair. On dark hair it is more likely to show up as a tint but give it a go. Kool Aid does wash out easily if it is not the result you want. 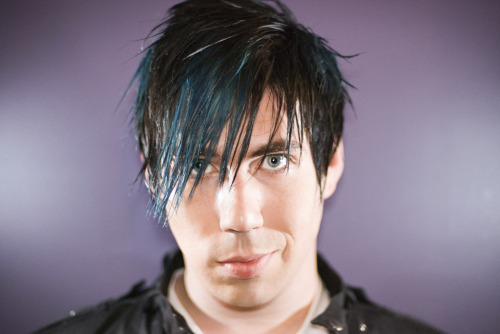 My friend was thinking of doing this as part of his halloween costume (Josh Ramsay from Marianas Trench), but he has black hair. Will the Blue/Electric Blue show up in his hair? It’s definitely worth your friend Josh giving it a go, but it doesn’t tend to show up as well on dark hair. He could have a practice go and if it doesn’t work, Kool Aid washes out easily! Good luck to you both. That sounds like a good idea, a red tint is always eye catching. If you bleach your hair first it would work and create a stronger color. Kool Aid may work for now we wouldn’t suggest you to use as a long term method, this really is a temporary product. However to help maintain the color and condition of your hair we always suggest to use color enhancing conditioning products and use them more often then you usually would. Good luck and let us know how you get on! I’m just wondering which dip dye color would fit with black hair? a bit lighter on the ends?? The most popular dip dye color for dark hair is red. You may have seen people like Jesse J sporting a black and red dip dye look. I do need to warn you though that Kool Aid doesn’t show up as well on dark hair so it may take a few attempts. Although I like your idea, unfortunately Lemonade Kool Aid won’t show up on dark brown hair. Are you just looking to lighten the ends of your hair or do you fancy adding a different color? Hi! I plan on coloring my hair purple. I have colored blonde hair. I’m curious as to whether the purple with turn out looking like a magenta-ish color (Like color hex: #ed24e0)or have more of a blue hue like lavender (color hex: #b57edc)? Good luck Jess and you’re welcome! You are more likely to end up with a pastel shade, more like a lilac. It is impossible to say for certain what the color will be, but the hex code would be more in the region of #86608E. There is no reason why purple or blue shouldn’t show up on light brown hair. Kool Aid tends to work better on lighter hair. Good luck and feel free to let us know the results! Hi! I have black hair. If I used blue kool aid, would it show in my hair? I’m thinking about dying my tips blue over the weekend bc my hair won’t take in walmart dye I buy so I’m hopping koolaid works… I have dirty blonde hair….. I asked people at school about how to do it and they said not to shampoo it because the dye will come right out… Is that true? I dyed my hair with cool aid yesterday with purple at my bleached tips and it turned green brown. How long will it stay in? i dyed my hair with tropical punch kool-aid and used the boiling water method and saoked my hair in it for 5 minutes how long should it stay in for? There are no guarantees with the result using Kool Aid but it should reassure you to know that it is washed out easily! How quickly Kool Aid washes out depends on your hair and the care given to the up keep of the color. Kool Aid can last anywhere from a week to a month. Generally if you do not use products to maintain the color and wash your hair more it should wash out faster. Dying your black hair may just give you a tint of blue. On dark hair, Kool Aid doesn’t show as vividly. Kool Aid can wash out easily so it would be a good idea to wait longer than normal to washing your hair with shampoo. I realise you wrote this a little while ago now, have you tried it yet? The color should wash out quite quickly, you may need to give you hair a good wash with some cleansing shampoo. Has the color come out yet? The color can last anywhere from a week to months. It totally depends on your hair type. Did you achieve the look you wanted? -hi susie so im trying to dye my hair aqua blue an i have black hair would it work?? I would not rule it out as impossible, but it is a lot harder to dye black hair using this Kool Aid. To lift darker hair bleach is needed and as it there is no guarantee I would make sure this is definitely the shade you want before trying. Hi! I have done aqua koolaid on the underneath-layer of my hair,(I am a dirty-blonde.) and would like to do it again. but since i just got highlights put in the top-layer. I’m now afraid that the dye will color my highlights! Hi! I have done the aqua koolaid in the underneath-layer of my hair. (I’m a dirty blond.) I would like to do the same thing to my hair, but since I have gotten highlights on the top-layer of my hair, I’m afraid that the dye will color my highlights!!!!!! 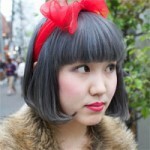 To avoid reaching your highlights you need to wrap the sections of hair you are dying in foil, to keep them separate. Did the Aqua Kool Aid work well on your hair? Let us know how you get on! I am interested in the kool-aid method for its temporary effects. I want to dye my hair red for a halloween costume. I have brown/light brown hair with a few natural highlights. I’m wondering if the red cherry kool-aid would work just for the weekend and if I would be able to wash it out by the time I went back to work on Monday. Obviously, I’d use the conditioner/cold water method as it seems to have a more short-term result, but how long are you supposed to leave the kool-aid mixture in your hair? Can’t believe Halloween is nearly here already!! What’s your choice of costume? You should normally leave the mixture on for up to 8 hours, however if you don’t want as strong result then I would suggest to leave on for 4 hours. There are no guarantees with Kool Aid but hopefully with a few washes this should rinse out well. You are absolutely right. It sounds lovely to and I hope it goes well! I want black highlights for the tips of my brown hair, I used purple, it came out black, so would that work? I have dark brown hair but I dyed it a couple of times. If I use the kool aid to dye my hair will it change to a different color ? If the purple turned to black on your hair and gave you the result you wanted then I would just use that! The only issue is that when the color washes out and lightens it may fade to purple. There shouldn’t be any issue using Kool Aid. It wouldn’t harm your hair to leave the mixture on longer if you are worried it will now show up well. Just be aware that Kool Aid is a fairly recent tool for hair dye and you are not always guaranteed with the results. When it does work well it looks fab! If you are only coloring one section of your hair you can probably get away with using one sachet. Depending on how thick you hair is will depend on how many sachets you need to use and you can always add more. I am an ashen blonde and I was planning on dying part of my hair into a pastel lilac shade using Kool Aid. I was wondering if it would be better to use the grape Kool Aid then let it fade or maybe mix it with conditioner to reduce the color, or to try and mix the blue and red together in hopes of getting a more muted shade. I’m thinking of going red for halloween, and i’ve tried reading through the comments to see if this has been answered, but does it usually completely wash out in due time? and is it minimum 8 weeks? also, if we’re not doing it before we go to bed, how long approximately should the paste be left in hair? I would suggest to try the grape Kool Aid! If you don’t use too many sachets and don’t leave the color on as long you will most probably get the shade you are hoping for. Mixing the blue and red is a little more tricky. Kool Aid does wash out, it all depends on your hair type, how long you leave the mix on for and how many sachets you use. If you are coloring your hair for Halloween and don’t want it to last as long I would suggest leaving the color on just for 6 hours and I would use 2 sachets. I hope this helps and let us know how you get on. Hey the black did fade to purple which turned red. But I really liked it! I never thought about that colour, but I loved it! So now I`m using tropical punch to do red, and I LOVE the look! Oh BTW if you get kool-aid stained on your skin, use soap and coffee grinds. I had bloody red hands(lol! ), and did that. And your hands won`t smell like coffee, just soap. Just adding that because I HATE getting it on my skin. what kool aid packets do I mix for a dark pink color? I really want to dye my hair red this summer but I can’t have it stay for school so would this work for about 2 months becuz I want it to last but not to long. That’s wonderful news! It’s awesome when you find something that works well for you! Thanks for sharing your tip as well, how did you discover that? Was it by chance that coffee worked? Our tip to achieve this pink would be to mix Cherry Kool Aid with a white or light colored conditioner. This should lighten the shade of red to a pink. Mix in small amounts at a time and see how it goes. I hope this helps and let me know how you get on! Kool Aid can last a couple of months but it depends how much of the product you use, how long you leave it on for when dying and your hair type. The rule generally is that if you leave the mixture on longer and than usual it should take more. There is always a little bit of a risk with Kool Aid so make sure you check with whoever is in charge at home! i have dirty blond hair and I want to put a streak of purple in it. if i want it to last for a while should I use hot or cold water to make the paste? and what should I wash my hair with? Hi there! My little sister has light blonde hair and dip-dyed her tips pink using the boiling water method about two months ago. The color has faded a little but is still very visible in her hair. Now she is hoping to dye her hair back to a solid blonde shade without trimming the kool-aid color off, and is wondering if there will be any weird side effects because of the colored dye. Do you have any knowledge about this? We advise just to use cold water to make the paste and to wash your hair with your normal shampoo and conditioner. You could try leaving the mixture on for longer than usual to see if that helps but with Kool Aid nothing is guaranteed. The great thing about Kool Aid is that it doesn’t cost a lot and is chemical free. Good luck and I hope it goes well! I haven’t heard of any weird side effects when dying hair after using Kool Aid. The chemicals and bleach used to lighten hair should work harder than the Kool Aid mixture so it should cover just fine. However, for more peace of mind your sister could try a clarifying shampoo first to cleanse the hair as much as possible. I hope this helps your sister. You can create purple by using Triple Awesome Grape. When you are creating the mixture, use a couple of packets of this Kool Aid and put little amounts of conditioner in at a time until you are happy with the color in the bowl. Please be aware though that if your hair is darker there is a danger of the result turning out a lot darker, closer to black. Purple Kool Aid usually works better on lighter colored hair. What color is your hair? Hi there! I wanted to try out the kool-aid dip dye for a whole now, but before I do, I have a couple of questions! My hair color is naturally really blonde at the front, then it fades to brown at the back. What color do you think would look the nicest? Also, how long will it last in my hair color? I was hoping 2-4 weeks, so which method (cold water or boiling water) would make that happen? Thanks for the previous tips!!! Kool Aid is a really good alternative to hair dye and can last up to 8 weeks, but it doesn’t come with guaranteed results so please keep in mind before using. I recommend either method but usually the longer you leave the mixture on the stronger the color is. In terms of color for lighter hair, personally I think blues, pinks or purples looks fab. Have fun mixing up the colors too if you are feeling brave! I hope this info helps and let us know which color you decide on! Hey Susie. I ended up deciding on purple! I’m trying it next weekend, so I’ll let you know the results!!! Thanks! I hav dark brown hair and I want a pinkish red look? I don’t want just a faint look so wut should I do? Oh ya. Also how do I bleach my hair if I’m gonna do that b4 I dye it with kool-aid so it shows up better? I just wanna do a streak about 1 inch kind of…? I do like to advise that when using bleach that you consult your hair dresser first and see if they will do this for you. It can be tricky and I wouldn’t want anything to go wrong when using bleach! To mix the “pinkish red” color, I would suggest to use a red Kool Aid and mix with a light colored conditioner until you reach the desired shade. I hope this helps and let us know how you get on! You’re so welcome Nik! Really glad you got the results you wanted. Hope to hear from you again! Hey Um I have Lightish/Darkish Brownish straight hair and I want to dye the lower part of my hair red using the boiling method since it’ll last longer, But I have a few questions before I do it 🙂 I wanna know how much sachets I should use? (i want it to stay as long as it can) And how long I need to have it wrapped? And will the kind of conditioner affect the results? Will it effect how it looks if you have in hair gel in your hair? I did the dip dye method on my daughters hair using grape koolaid, and it didnt turn out. she has dirty blonde hair and I tried the paste method but was told to do the koolaid with just water and I put it on and put foil on it and let it set for a while and took it out and rinsed it, it was all gone so I tried doing the boiling water method. I mixed about 6 packets of koolaid each time and dipped her hair and left it in there for 5 minutes and rinsed it out and conditioned it and it only did a light pink color. I must add I cannot find sugar free koolaid at any local store near me and used regular. How exactly can I do a bright purple color and actually get it to work and last the longest. Shes four years old but really wants purple hair so the overnight part wouldnt work for her!!! I go to a salon and get funky colors put in my hair in highlights and just did dark blue on only the ends and she loves it which has brought on the fad for her!!! please help us accomplish this!!! I have dirty blond hair with auburn highlights in the sun and I want to dye hair with the boiling method. It won’t matter time wise because my school allows it. And I’m on the school wrestling team so I wear a cap(yes I’m a girl). I what to dye it electric blue or bright red. But I don’t really want the blue to turn green. Which color would show up better? How long should I leave my hair in the water? Oh and my hair is fluffy and curly……… What conditioner is best? How many a packs do I need? Any other colors that would work well in my hair(just not purple)? I really like neon or bright colors? Any way to make it super bright? I’m just doing the tips of my hair all around.How long should I let it sit? How long till I wash my hair if I want it very bright? My colors are bright red, light/bright green, bright blue and electric blue, which ones best for me? How many sachets you use depends on your hair type (length of hair, density of hair). We usually suggest that 2-3 sachets should do the trick but I would buy more just in case you need it. In the article we suggest to use leave the mix in your hair overnight which is usually around 6-8 hours. For the conditioner, I would recommend using a reasonably good/well known brand. You don’t need to spend a lot however I wouldn’t suggest a cheaper conditioning product as it might not protect your hair as well. I hope this helps and look forward to hearing how you got on! If you want a bright red look, go for Double Double Cherry or for a lighter tint of red try tropical punch. Good luck and I hope you get the look you want! We would always recommend that you dye without any gel in your hair as there is a possibility it could affect the result. Which color are you going try? Hey! My name is Ally and i have honey blond hair. What pink should i use for my hair? I have had a look and I think the best Kool Aid for honey blonde hair would be Pink Lemonade. Are you trying the dip dye affect? I have dirty blond hair with auburn highlights in the sun and I want to dye hair with the boiling method. It won’t matter time wise because my school allows it. And I’m on the school wrestling team so I wear a cap(yes I’m a girl). I what to dye it electric blue or bright red. But I don’t really want the blue to turn green. Which color would show up better? How long should I leave my hair in the water?Oh and my hair is fluffy and curly……… What conditioner is best? How many a packs do I need? Any other colors that would work well in my hair(just not purple)? I really like neon or bright colors? Any way to make it super bright? I’m just doing the tips of my hair all around.How long should I let it sit? How long till I wash my hair if I want it very bright? My colors are bright red, light/bright green, bright blue and electric blue, which ones best for me? Personally, I think electric blue is going to stand out a lot more on auburn hair, so you should try 2 or 3 sachets of Blue Raspberry Grape Kool Aid. You should leave the color in to develop over 6-8 hours and use a well branded conditioner (anything to enhance color is a good choice). I hope this helps you Maddie and if you need any more info please ask! my hair’s black so what color would show the best from theese —–}pink?purple?electric blue?or red? ?can you please give me 2 of the colors from here??? I would say red or blue will show the best but I have seen purple look awesome on black hair! after you dye your hair with the kool aid, and it has faded will it fade my orignal hair color on the part i dyed or stay the same? The Kool Aid should eventually just wash out and leave you with your original shade, however with Kool Aid there are not guarantees! What look are you going for? I have dark brown hair with natural highlights (i.e. GRAY) and I am tired of trying to cover it with my natural dark brown color, and thought dyeing them a fun color would be..well, more fun. Have you, or anyone else, tried this on gray hair? How well does it work for that? I thought bright pink or purple would be fun, especially for an old lady like me! The hot method won’t be an option for my roots as I don’t want to burn my scalp, so I figured the cold/warm version might be best…what do you think? What color kool aid would look best ??? I tried this and its been 3 months and it hasn’t come off!! I think this could definitely be fun for you. I haven’t personally met anyone with Kool Aid on gray hair but I have seen pictures. I have seen purple and turquoise on gray hair. Personally I thought purple looked better and a little more subtle (if subtle is the right word). Also, the cool/warm method would work just fine. Feel free to let us know what you go for. I would be really interested to see. I have seen pink look nice in orangish red hair. For a quite a striking and dramatic look I have seen purple/blue. Is it a subtle or dramatic look you want to go for? Kool Aid can last up to 3 months. Is it still really strong? If you dye your hair normally than an all over semi/permament color should get rid of it. Kool Aid is chemical free so it should be safe to use. We cannot give certainties but I can’t see why it should be dangerous. Will it take on gray hair? When I had less gray, I used to use Natural Instincts, which was semi-permanent. Now they don’t make any pinks or purples. The effect is that the hair that’s still dark stays dark, and the gray goes pink. A very cool effect. But will the gray hair absorb it? There shouldn’t be any reason why it doesn’t work. This is a very different product to hair dyes you buy in stores. This is a natural product and is chemical free. I hope it does work for you, good luck! Do you know if you can use leave in conditioner? I have red hair naturally and would like to dye it bright red – will I need to bleach it or should it come out alright? OMG! Last night I spent 2 hours studying every word on this page! I then RAN to the market and picked up a total of 60 sachets of Kool-Aid in 4 different flavors/colors! My daughter and I the used the boiling method to cook 15 pink lemonade and 5 red sachets. We then let the mixture cool to body temperature. Then we took a diposable turkey roaster pan and poured a solo cup full at a time over our pure white Persian cat! We were able to continue reusing the Kool-Aid mix by dumping it Back in the bowl from the. Pan. The cat now looks like he always should have! This combo only took from starting the mixture to the time I shut the blow dryer off! I used human shampoo and conditioner before I dried him. Imagine the joy a cotton candy colored big fluffy snuggly kitty will bring us! Hi! I have dark brown hair, but I just want to take a small (but fairly thick) section of my hair (the part I normally tuck behind my ear) and dye it an greenish blue, aqua color. It doesn’t have to be super strong but I don’t want it to be faded either. I don’t know how to bleach my hair and honestly I don’t want to have to put in that much work to get it colored. And I want to do it with Kool Aid. Any suggestions/tips? Also, I’d like it to be semi-permanent; aka, it’ll last a 2-4 months, in case I don’t love it, but if I do love it it’ll stay in for long enough. What do you think? I have dark brown hair, that would only really show in the sun, but it doesn’t look black . I wouldn’t like to get my hair bleached, but do you know which kool-aid color would really show for the type of hair I have ? I want to dye my hair blue. I have dirty blonde hair. Will the blue still turn green? If so how do I make it a light blue? I just wanted to say this helped a lot. And if you want to make your hair a little lighter so it will work, you can put lemon juice in your hair, leave it in for an hour or two then wash it. If you do this a few times, it will made your hair a little lighter and make it easier for the koolaid to show. I have light blonde hair and i want to do the turquise color on it. will it actually turn that color with my bright hair. i want to keep it in for 3 months. what can i do to keep it in for that long??? I have dark brown hair i wanted to know if i put red or blue in it if it would work ? I also want to keep it in for a month what do i do to keep it that long? How do you get a pastel purple/lilac ? so im going to kool aid my hair and my friends stayed in for a year and i dont want it to stay in that long and advice? Hey, susie i decided to do .. Torquiouse .. but i got dark brown hair how much do i use of Blueberry and Lemon-lime? Please help. I dyed my hair red four weeks ago and it looks nice but now its auburn brownish and it wont come out s just becareful of how much you put in. Hey. I have dirty blonde hair and I was thinking of dyeing a few streacks turquoise but my mum is araid that it will turn out horrible. How can I assure her that it will be okay? Also how will turqoise turn out in dirty blonde hair? Thank you. I have dark brown hair.I want it to stay in for a while.What method would work best boiling water or not boiling water?Also what color red or purple? Hey guys! I have never heard of the cold water method. but I do the boiling method and one thing I’m noticing is you guys are only leaving your hair in for 5 minutes. It should stay in for about 10. And when you take it out, blow dry then flat iron. It should stay for many months, but needs redone (to keep vibrant) every month. And Kristen, the pool will have a slight difference but if you blow dry then flat iron after dying, it keeps it in longer. You guys need the heat to lock it in. And Kool-aid isn’t short term, its stronger than semi-permanent, but not entirely permanent. And purple users, mix 2 black cherry and 2 berry blue/mixed berry. Purple simply comes out brown. Hey I have like a dark brown hair color and I want to dip dye my tips with tropical punch koolaid. I’m going to do it with the boiling water method. How long do you think it is going to stay for? do you think its going to be a nice color? is there a way to do kool aid hair dye faster WO using the boiling method? I want to dye just the top of my sons mowhawk one color and put a different color on the sides. I don’t think he’d make it overnight. I have a dirty blonde hair color and I wanna use red and electric blue would it still come out how it looks? & my friend has dark brown what color would show most in her hair? Hi I dark brown hair what color do you think would work best with my hair or does it just matter how much of It I put in? hey! well, i hav black hair :/ and im not sure if the red will show up. or how long it will stay. Hey!This summer i m going to dye my hair with kool-aid and my hair is dark brown and i don’t know which colour to pick?DO you have any ideas which colour will match with dark brown? About 4 packets to have a rich color. If I have dirty blonde hair and I’m dying my underneath dark blue how kind do you think it will last? And how dark do you think it will show up? About 3-4 months. If your hair light, it will turn out VERY bright. Hi everyone! I have very light brown hair, close to blonde. I wanted to dye my hair completely purple with kool aid, but I don’t have enough time for it to be overnight. I was looking around online if I could leave it in for 3-5 hours before rinsing it out and not have it all come out. I have an event on Friday that I’m going to but I have no free time this week besides Friday. is it possible to do all of my hair, then rinse it out after 5 or so hours of it sitting in, but not having just a tint of purple? If you have blonde hair, you only need it to sit for about an hour. I am trying to get a deep purple, like real deep. What flavors do you recommend i use? I have dark brown hair btw. Hey,I have light brown hair thats wavy and in the sun i have auburn higlights.oh and I have natural blonde highlights too.anyway what color would look the best,just wanna dye my tips(maybe an inch).i have school in a couple of weeks,tips? hey there I have red tips already but I want to bdye my tips a vibrant orange color. how many packets should I use and how long should I keep it in? Hi- I hope someone is still reading these, I see this page is older. My wife is a teacher with beautiful long dirty blond hair. She told her elementary students that if they met their reading goal before the end of the year she’d dye her hair- they chose hot pink and they’re a week away from winning. She wants a dye that will last around a month and be hot pink. We thought kool-aide… but there are so many different ways to do it and we’re not sure how to make hot pink- what would you recommend???? Well I know that red stays red. I also know that turquoise turns into almost goes to a tinted teal. Green fades to yellow, and sorry that’s all I am aware of. But I hope this helped! Hi my hair my hair is a brown\gold type of hair im thinking about doing this with a friend but im worried that it will stay in long it has to be out by school!!! should I use hot or cold water??? And what color should I use if it stays in long what should I use!!! Hi. I have blonde hair and last night my friend and I tried dying our hair with cool aid and it didn’t work out that well. I thing I added too much water in mine. How many cups of water should I put per package? How vibrant will this be on bleached hair? And how are some ways to take the kool-aid off? I have dirty blonde hair and I wanna dye the underneath of my hair like a tealish color does anyone know how long I should keep the color in and what colors I should use to make the teal?? I want to kool-aid dip dye the tips of my hair purple, but my mom couldn’t find any sugar free kool-aid. Instead, she bought me some kind of generic fruit drink, that sounds like kool-aid, but isn’t. Will it work? Please answer ASAP. I have dirty blonde hair, so I think purple will work. I was afraid to use blue because I thought it would turn my hair green. If I had already bleached my hair and colored it with blue splat and it turned out too light, would the blue raspberry darken it up? TY! Does your hair have to be dry? DO NOT RINSEWITH WARM/HOT WATER! That is what makes it come out. you want to rinse with COLD water! Hope this helps!!!! I have really dark hair and want the red to show up really well. But there was no yellow kool aid to lighten my hair first so I bought orange. I’m not sure if orange will work the same way..please help!! Hey! I have previously highlighted my hair professionally and I am worried that it may affect the Kool Aid. Do you have any thoughts about that? Thank you! HI. I want to die my tips with cripple cherry/ pink lemonade. I have EXTREMELY light blong currly hair , Its almost fall and my hair is weird it’s color seems to change with the seson and a since after this color comes out I want to re die it the same way. Will my weird changing hair affect the color of the dye? No I fails not meaning to comentbon yours. it stays in for a looooooooooooooooooooooooooooooong because i know because i still have it in and yes im only 8 and i dyed my hair with kool aid. Hun. Don’t tell ta whole world your age it a bad idea. You don’t ever know who or what is out there on the world of internet. hey I want to dip dye my dark hair and was wondering if you could make a maroon colour out of it? or if there is one? because if there isn’t I was wondering if I mixed colours together I could make a maroon colour? I wanted to ombre my hair with this but it’s dirty blonde so how well do you think it would show up? I dyed my 4 year olds hair with cherry Kool aid about a week before Halloween. I boiled the water and dip dyed the ends. Her hair is still vibrant red and now she wants to go purple. I’ve tried using vinegar to get it out but it is still there. Any suggestions about this? Can I just use grape kool aid? I’ve decided to dye my hair blue with kool aid- all of it. I used three packs of mixed berry, one of grape, and I believe two of blue raspberry lemonade (or whatever the flavor is called). My hair is really short but VERY thick, so I used a lot and it just barely covered all of my hair. It’s also a dirty blonde/light brown color, so I’m hoping that the blue takes to it well. I’m currently waiting to rinse the stuff out and hoping that it turns out well. And holy cow, no one warned me of how strongly the stuff smelled! I’ll probably smell like berry cough syrup for a week, haha. When I did this my hair became dry, I have dark curly hair so that may be my problem. I also only did it in one section just to make sure it works which It didn’t. My last method I dried worked out better than this. I wonder if I did anything wrong but I don’t know. And the color wasn’t vibrant I only used 1 package of red cherry for a small section. Hello, I have dark brown hair and I want to dye it red. Will it look cool? I’m wanting purple but going from dark brunette. Any thoughts? Hair Colors – Starting With The Basics.